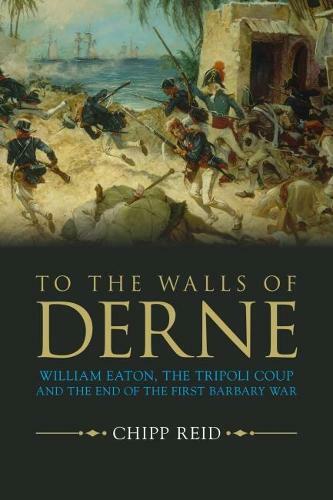 Set amid the backdrop of political infighting, interservice jealousy and diplomatic intrigue, To the Walls of Derne is the story of William Eaton's effort to topple Bashaw Yusuf Karamanli, the ruler of Tripoli, and replace him with his brother, Hamet, who was sympathetic to America. Coming in the fourth year of the war with Tripoli, Eaton's coup attempt marked the first time the United States attempted "regime change" in another country. Although it had the backing of President Thomas Jefferson, problems - political, military and logistical - beset Eaton's campaign. At the same time, the US Navy continued its campaign against Tripoli, ranging from blockade to planning for an all-out assault on the city. Neither Commodore Samuel Barron nor John Rodgers, the commanders of the American squadron, support Eaton's mission and also did not want the former Army captain to grab the glory of the ending the war. Meanwhile, Jefferson sent diplomat Tobias Lear to North Africa with specific orders to negotiate an end to the war. Despite the roadblocks, Eaton's indomitable will carried him through. He landed in Egypt, searched for and found Hamet Karamanli, assembled an army that included First Lieutenant Presley O'Bannon and seven U.S. Marines. Eaton led his army across the Egyptian and Libyan deserts to attack Bengahzi and had to contend with mutinies, cantankerous allies, hunger, thirst, and lukewarm support from Navy. Almost to spite his detractors, Eaton accomplished his mission, with O'Bannon and his Marines leading the charge that took Benghazi and becoming the first U.S. troops to raise the Stars and Stripes over a foreign city. Just as he seemed on the verge of victory and ousting Yusuf, however, Lear negotiated an end to the war, forcing Eaton to abandon Hamet, his army, and his dreams of glory. To the Walls of Derne looks not only at the military aspect of the campaigns, but at the character of those involved. It uses Libyan sources to provide insight into the persona of Yusuf Karmaanli, who was far from the mindless brute many as Western historians portray him. Karamanli was a fascinating character and arguably among the first Arab nationalists. This book also breathes new life into Hamet Karamanli, who, despite his chortcomings, was a brave combat leader and devoted family. It also examines the role of the US Marine Corps in the campaign in detail - a role that literally saved the Corps from extinction. It delves into the tangled web of political, military and diplomatic efforts and competing interests that plagued the final year of the Tripoli War and gives new insight into the larger-than-life character that was William Eaton.